The Sea Hawk Temperature Controller..
Digital timer with internal battery backup. Easy to set with heavy duty with 30Amp inner relay. 2400..
LMU 12 timer outlet- 4 live Hard wired with timer 80A Main 12000W rated. LMU with 4 sockets. Designed to handle 3000W of HID lighting. Circuit breaker included. 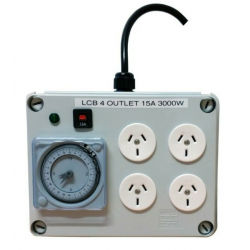 German timer..
LMU 6 outlet Hard wired with timer 40A Main 7200W rated. LMU's Custom built light management units. Custom built light management timer boxes, LMU's for short. Built by electrical engineer in Australi..
Nakajima 10amp Digital Timer 16amp switching relay, 1sec capable. Nakajima digital timer. 10 amp timer with 16amp relay switch for induction loads. Rule of thumb .4 X.. The Primair Controller is an indoor climate controller, designed to be used with extraction & inta..
Cycling timer with 2 outlets. This is designed to run you on and off cycles in defined settings rath..